Creating my everyday: 35 years! That's how old my hubby is today! We're having a cookout later this afternoon/evening to celebrate, so i'm frantically trying to get ready to have about 45 adults and children at my house! Wish me luck... i'll need it, lol. I did this layout last night - these photos are from when Chloe was about 11 months old, and although she's a pretty petite little thing, she still has those big old squeezable thighs... I love them! 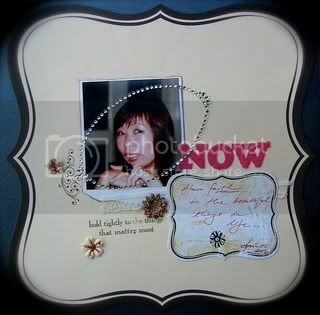 Paper is K&Co, MM, American Crafts and Jenni Bowlin. Letters are Heidi Swapp and label is Martha Stewart. That is too too cute!! I love squeezable thighs! LOL My Kati was the same way! Have fun tonight and happy birthday to your DH! Looks like we are in the same boat today! Good luck with your cookout! Happy Birthday to your hubby!! Your layout is absolutely gorgeous!!! OOOH, Staci! Those chunky thighs are so adorable!!! LOL! I love the photos, and your layout is beautiful! what a fun layout ! love the papers you used & how you've used them ! The colors you used on the layout are great!!! I wandered over here from another blog. 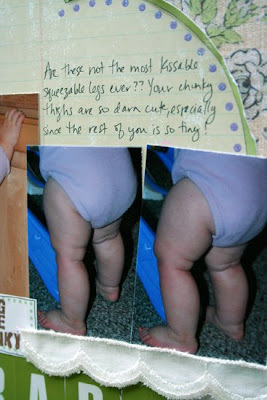 I love the scrap page--and I love those chunky thighs!! Staci this layout is so cute!!! Love those little chubby legs!!! Hope you had a great cookout and your hubby had a great birthday! Awe..this is adorable. Baby thighs...my baby is 8. She had tubby thighs too. You did a wonderful LO and something you can always smile about. Wow...that's a pretty big birthday bash for him :) That's what I'm planning for Caeden's first birthday on Sunday. A big cookout birthday party for him w/ about 30 people...it's going to be a bit crazy. Let me know how yours goes...maybe you can give me tips! Adorable layout!!! Happy Birthday wished to your hubby!! Awww...love those little thighs! Em was just like that - only bigger!lol What a beautiful LO, Staci! OHH!!! I hope your dh had a wonderful birthday!!!! I really do love this lo!!! SO very precious!!!! Oh my gosh! Cutest layout ever! Love it!